This historic home built at Red Cloud, Nebraska in 1879 was home to Nebraska Pulitzer Winning Author Willa Cather from 1884 to 1890, It remained the Cather family residence until 1904. 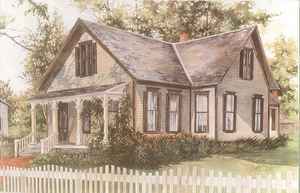 The house, which has been restored to its original exterior colors, and each of its rooms is described not only in The Song of the Lark, but also in "Old Mrs. Harris" and "The Best Years". It was declared a National Landmark in 1972.